South Korean actress, Jung Ryeo Won (정려원) attended actor, Uhm Tae Woong (엄태웅) and Yoon Hye Jin (윤혜진)'s wedding reception held at Conrad Hotel in Seoul, South Korea on January 9, 2013. 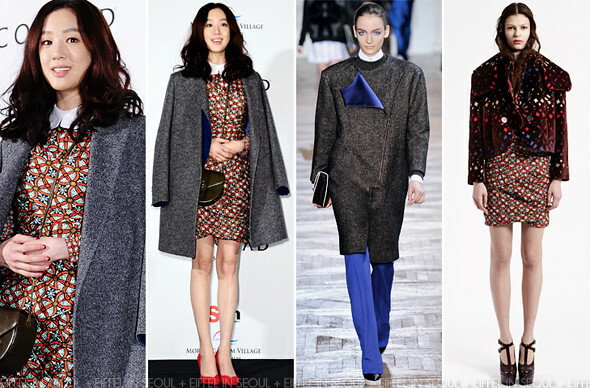 She wore a grey wool coat with reversed blue placket with Carven 'Window' print dress, both from Fall/Winter 2012 collections. A brown cross body bag and lovely red wedges to complete her super chic outfit. Those red wedges are so lust-worthy. I enjoyed the styling of the entire outfit.